Home Match Our Spurs team to face Swansea – What’s yours? 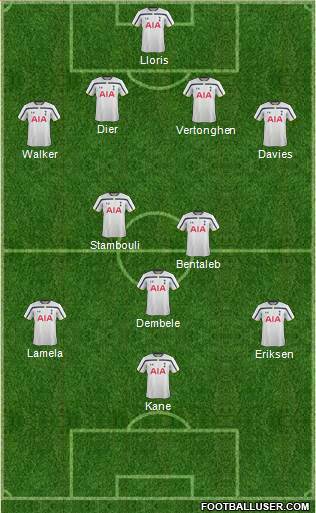 Our Spurs team to face Swansea – What’s yours? Having lost two vital games in a row it’s time to get back to winning ways in the league, as Spurs attempt to end their season on a positive note. Mauricio Pochettino will soon be in a position where he can play his strongest team in every game but having played in Italy last week, in a cup final at the weekend and with a match to come at the weekend, some rotation could be necessary. That said, there’s certain players that just don’t have a viable option to replace them and simply must play if they can. Kyle Walker, Jan Vertonghen, Nabil Bentaleb, Christian Eriksen and Harry Kane fall into this category. With that in mind, here’s our team to face Swansea tonight. What’s yours? Perhaps give walker a rest and play Vlad. We need to start playing Vorm as Lloris will leave in the summer. Tonight would be good against his old club. Lamela frustrates me. Fazio and Vertonghen were looking solid for a while. Dier still learning but has a lot of potential. Good to see Stambouli in your pick. Mason is great but needs a rest. will reduce the potential of chips or breaks on the actual figurine. with in large volumes such as your paint color.